Presenting a array of Foot Mounted Hoist provided with direct connection to support structures. Available with us is an extensive range of Foot Mounted Hoist which is fabricated using best quality raw material. 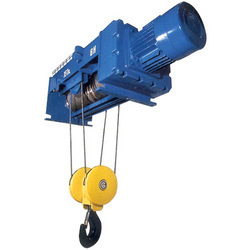 These consist of a hoisting gearbox that can be mounted directly with rope drum and motor is mounted with gear coupling or geared brake drum. All units feature’s standard hoist technology with the option of across the range for enhanced safety, precision control and productivity. Our range can be customized according to the needs of the clients.